With Great Power Comes…Who Cares?! Admittedly, I have been anxious for this game since the end of inFAMOUS 2. The ending(s) were just too ambiguous for me to be satisfied with the “conclusion” to the series. I had hopes and big dreams of what a sequel would be. When it was announced I immediately forgot about it so everything could be fresh and new for me when I fired up the final build of inFAMOUS: Second Son. I wanted to make sure I received the true experience. The experience is by and large what I’d expect from a next-gen title. So, in short, inFAMOUS: Second Son is exactly what I was hoping for and then some. But you know the routine - the longer answer gives you some juicy details and reasons for you to pick this game up today! 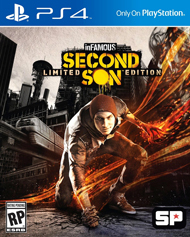 Second Son is an origin story of a brand new character inside the mythos of inFAMOUS. Delsin Rowe is a rebel without a cause, who probably shares more in common with Bob Dylan’s Desolation Road than just his name sounding like it. It screams part typical rebel story and part fresh take on the troupes of the kid trying to find their own way fiction. Like I said, Delsin is a rebel, he tags buildings with wonderful artwork, and really has this “screw the man” attitude even in the beginning. This is only further displayed when you discover that the sheriff hounding him in the first few moments of the game is his brother. However, there’s something a little more to him than just this. You see, much like any story about a teen hero’s beginnings there’s this underlining moral center of good waiting in the wings. With inFAMOUS stepping in to bring out the hero or anti-hero through choices you are able to make throughout the game. I specifically say hero and anti-hero due to there’s no defining lines of villainy in the character. Sure there’s still the karma choices in and out of battle, but none of the choices seem so villainous that Delsin couldn’t still be considered a hero, albeit a hero not to mess with. With Delsin’s power set, it really can go either way. At the opening of the game you are not a known Conduit/Bio-Terrorist, just a rebel without a cause other than to spray-paint your mark on the world. It’s not until a chance encounter with a Conduit that Delsin’s powers are unlocked through touch. Delsin absorbs these powers and, much like when Cole McGrath woke up in the first inFAMOUS, Delsin’s disoriented and jarred by the occurrence. It takes a few moments for him to go from a scared kid to accepting his new fate. This is truly a testament of the voice acting in the game. Delsin’s voice actor (Troy Baker) really brought out the fear and resolve in Delsin. His brother Reggie (Travis Willingham) is also another testament to the voice acting abilities of this cast. He’s not Zeke by any means, but he does have this familiar relationship and doesn’t ever come off annoying. Well except when he’s supposed to be the annoying older law enforcement brother. The voice acting abilities don’t just crumble outside of these two. The side characters and villainous new enemies really deliver on their roles. The new villain in this entry is so vile they need a nod in villain of the year award. Hell even the random street people don’t come across annoying with a limited vocabulary. Just like the soundscape being impressive, you will find nothing short of amazement in the visuals of the game. This is what next-gen is all about, or it should be. Much like the previously released Metal Gear Solid V: Ground Zeroes, Second Son delivers on next-gen graphics. The characters movements are fluid and wonderfully executed. The environments come to life and never feel robotic. The mixture of day and night with weather effects raises the bar for all forthcoming titles. However, it doesn’t just stop there. 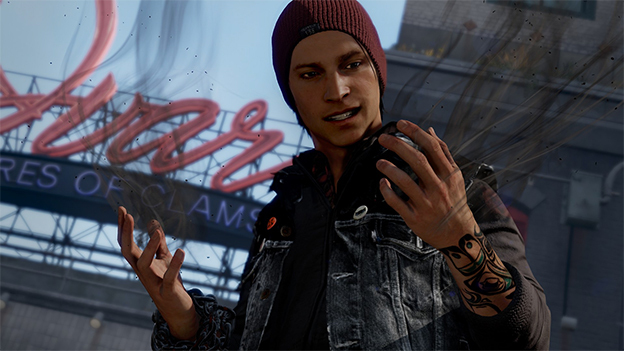 With Delsin’s multitude of powers throughout the game, each one brings a different graphical capability into focus. With smoke the trails of ember and smoke around Delsin are something to admire. 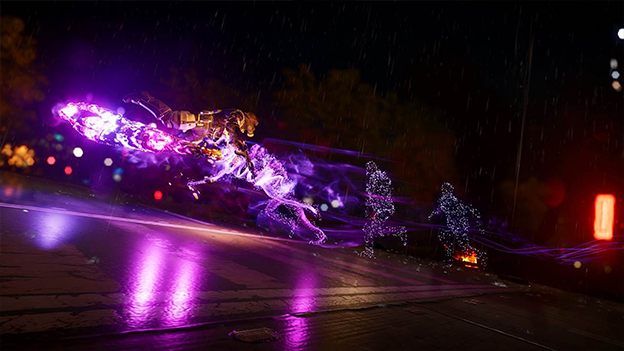 The neon ability sparks the imagination of what we’d see if The Flash ever received a game with this type of production value. I won’t spoil any other power, but suffice to say, you will be equally impressed. Speaking of Delsin’s powers, Sucker Punch really brought their A-game to Second Son. Each one of the abilities shares in a few similar traits, but diverge enough to be useful for different circumstances. Much like how Cole had to syphon the electricity from different things in the original two titles, Second Son allows you to pull for each one of the powers in different locations. The only downside to this is you can only harbor one power at a time. But draining the different power sources will instantly allow you access to a different power. Boy does it come in handy too.